I've been having a problem for the past few weeks. When I add new tracks (synchronize to pick up the new tracks, then analyze to derive the fingerprint and calculate BPM), it is kind of hit or miss if the BPM actually gets assigned. I'm estimating it "misses" about 20% of the new tracks. If I then go back to the library and manually queue the missing BPM tracks to be analyzed again, it will calculate and assign the values as it should. When I reanalyze, I turn off the fingerprint analysis, figuring that doesn't need to be done again. Needless to say, this problem is an annoyance. FYI, I'm not talking about huge numbers of new tracks at a time. Sometimes just a dozen or two. Sometimes 100 or more, which for me isn't that many. By the way, thanks for the 1/2 star rating increment. Much appreciated. I'm running a folder-based library. I have 361923 tracks on a single internal HDD. What are the exact options for BPM and Fingerprint analysis? When I analyze a group of new tracks, for fingerprints, both the boxes are checked ("Take fingerprint" and "Submit fingerprint"). For BPM, only the "Estimate BPM" box is checked, and the Range is "Automatic". Also, no other Analysis boxes are checked (no "danceability", no "mood", etc.). When I re-analyze a group of tracks that didn't get a BPM value written to them, the only difference is I uncheck the "Take fingerprint" box. Every time I've done this so far, every track that didn't get a BPM the first time around, gets one the second time around. And these are, definitely, tracks that were subjected to analysis the first time. Typically, I'll download one or more CDs worth of tunes, scan them into my other player's database, (sometimes) clean up the tags there to my satisfaction*, (usually) run a Replay Gain analysis there on the new tracks**, scan the tracks into beaTunes for the first time, skip the "Inspect" step, and do the Analyze step with the options as described above. When the analysis is done [and there is virtually never an error], I go back into my other player, rescan the music folders to bring in the BPM values. That is when I see that some tracks got a BPM added and some didn't. Then I go back into beaTunes and see, yes, those same tracks don't have a BPM in beaTunes for whatever reason. Then I re-analyze the selected tracks as described above. These are almost always mp3 files. In fact, I think every file I've had this problem with is mp3. I seldom deal with other music file types (m4a, flac, ogg, ape, etc). *- Sometimes I clean up the tags before the initial scan. "Clean up" to me means fixing or adding the song title, artist name, album artist name, album name, track number, year, composer, and genre. Sometimes it gets done much later. Sometimes (often) it gets done in pieces. Tag clean-up/enhancement is a never-ending process, it seems. **- I know beaTunes can do the Replay Gain analysis also. For consistency, I always do the volume analysis in my other player (MediaMonkey) because I've used that same player for years. 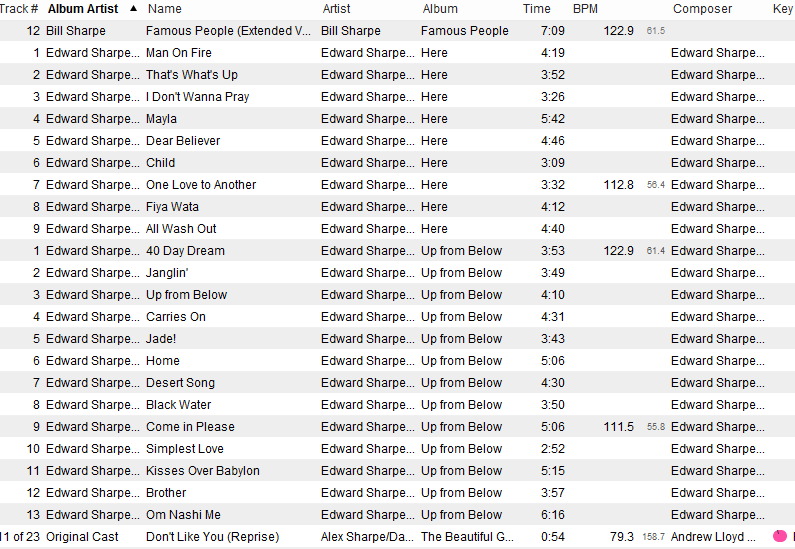 That player, however, doesn't have a BPM analysis module, nor does it have some of the other great beaTunes features. Yes, it does take some self-discipline to make sure the two apps don't mess things up for each other or in the underlying tracks themselves. I believe I am duly careful. I just uploaded my logs. I Synchronized my collection, adding about 250 tracks (and there might have been a very few deletions). beaTunes came back as it always does and asked if I want to Inspect my new tracks (I said "no") and do I want to Analyze my new tracks ("yes")? It gave me the list, I said "continue", and selected my usual options: Take Fingerprint (submit to database), and Derive BPM (do not overwrite, do not use online resources), and that's it. >>> I thought I noticed it said "adding 100 tasks to queue". That message doesn't stay up very long. It should have added about 250. When it finished analyzing, I went to look at some of my new albums. Sure enough, on one album, it only wrote BPM for 1 track (out of 9). On another, 2 tracks out of 13. Other albums were similarly impacted, although they had a higher percentage of tracks that got analyzed (4 out of 11 on another one I'm looking at right now). So maybe the problem isn't that it isn't calculating BPM on a hit or miss basis. Maybe the problem is that not all of the new tracks are being sent to the task queue after the synchronization. Yesterday, I also added a small number of new tracks (around 25? ), and it had no problem on those when I followed the identical steps as i did on the larger group today. I'll attach a screen cap of 2 of the albums that had the problem today. If I turn around and manually select the missing BPM tracks for analysis (again), it does them, no problem. That's why I'm thinking they're just not getting submitted in the first place after the synchronization. sorry it took me so long to react to this. I looked at your logs and indeed 100 tracks where sent to analysis. What the logs don't tell me is how many songs you selected or how many songs were shown. So I cannot really say what's exactly the issue here. The lastest dev-snapshot has some added debug messages that should clarify what's going on. Please install this latest snapshot and send me a fresh set of logs once this happened again. Hopefully this will help us getting to the bottom of it. I will do as you ask. What I can tell you verbally is that the synchronization picked up about 250 tracks, and I said "yes" when it offered to analyze all the new tracks it found. I don't know how many tracks were actually presented to me in the next box that pops up that shows the tracks it is about to analyze. I suspect it only presented 100 tracks to me there, but that is only a guess. The reason I know that the synchronization picked up all 250-ish new tracks is that after the analysis was done, and I went and looked at the new tracks, they were all there in the library, those that got a BPM and those that didn't. I have no doubt that what you say happened exactly like you describe it. But did you know, that only selected tracks in that window get sent to analysis? beaTunes should select all the songs presented to you, but who knows what happened. Getting some log statements is usually the best way to deal with this kind of situation. It appeared that all the tracks were selected, but I didn't scroll through the list so I don't know for sure. You and I are on the same page regarding logs providing much more definitive information. I am happy to send them and should be able to do so soon. I just sent a set of logs. I was watching more closely this time. I can see what is wrong. I synchronized anew, knowing that I had added 188 tracks to my folders (and deleted a handful of songs) since the last time I synchronized. Unlike v 5.1.11, it didn't ask if I wanted to Inspect the new tracks, but it did ask if I wanted to Analyze. I did, and then it presented me with the window of new tracks. It is helpful that they are numbered, so I could quickly see by scrolling down that beaTunes only presented exactly 100 tracks, and not the 188 tracks it should have offered. I went ahead and let it analyze the 100. Then I pulled up one of the artists I added tracks for. Sure enough, the library has all the new tracks, not just the 100 that got sent to analysis, but only the 100 got BPM added. I know from past experience that I can manually select the tracks that didn't get analyzed before and analyze them successfully, but that's tedious. Basically, it seems like beaTunes is limiting itself to sending 100 tracks to Analysis after it Synchronizes and finds more than 100 new tracks. This limitation must have crept in a few point releases ago. If it Synchronizes and finds 100 or fewer new tracks... no problem. It sends them all. Thanks for the logs. They helped me understand the issue—it has to do with a timeout, that only has negative side effects in large collections. I believe it's fixed in the latest snapshot: https://www.beatunes.com/download/beaTunes-5-1-12-SNAPSHOT-x64.exe (this is the same URL as last time, but by now a different file). It's looking good now. I added 253 tracks to the library, and it picked up all 253 for analysis. The "Inspect" question came back, too. Thanks! It's looking good now. I added 253 tracks to the library, and it picked up all 253 for analysis. Thanks for the accurate reporting and trying out the fix. Please keep an eye on this and let me know, should it not be fixed entirely. Because the issue had to do with a timeout, it may be intermittent. Just to put a wrap on this thread, as it turns out, this wasn't an Analysis issue at all, but rather an issue with Synchronize queuing up tracks to send to Analysis (and maybe for Inspection, too). I saw it as a BPM issue because that is the main analysis module I'm using right now (other than Fingerprint which doesn't have any visible indication whether or not it worked). (other than Fingerprint which doesn't have any visible indication whether or not it worked). Just FYI: Fingerprinted tracks have a little "thumb print" icon on their Get Info dialog summary page. But is there any way to know (i.e., through a filter or sort or something) which tracks do or do not have a fingerprint?